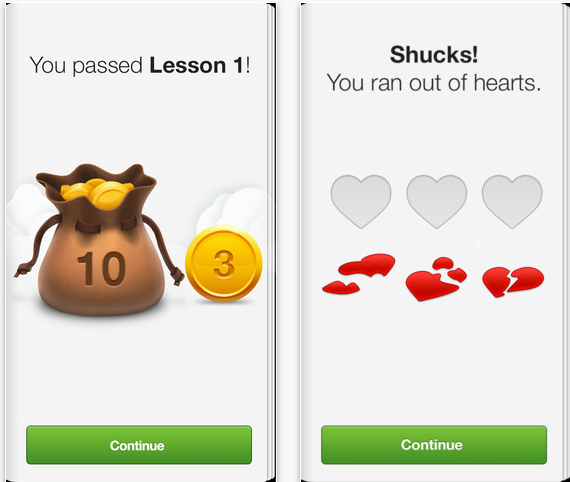 Duolingo Review – It's Our Travel App of the Month! Over 38,000 android users have given this app a top score of 5 stars compared to a very small minority of under 500 just 1 star, review ratios that are pretty much mirrored in iTunes too. As such Duolingo has been hailed the top app for travellers to download to get their head around a new language with fun, in fact addictively fun lessons. What does the Duolingo app do? Duolingo is a free and fun way of learning a new language. In a series of bite sized lessons where you can win and lose lives you can pick up a little or as much as you want whenever you like. It is great because it uses voice recognition to help improve accent as well as using written ‘tests’ to help grammar and spelling. The updated dashboard clearly shows your progress in points earned and words learned making it easy to monitor progress. At the moment Duolingo is available for learning Spanish, French, German, Portuguese, Italian, and English. It is a massive thumbs up – a fun, free way to pass the time on the move and learn something new. Most people have hailed it as better than any other language learning app, many have said that it is as good as getting college level tuition and most agree that that it is completely addictive. Oh, and it is super easy to use. This entry was posted in travel apps on July 23, 2013 by worldwideinsure.